An in-depth graphic about energy consumption in America. In the United States, we take light switches and electrical sockets for granted. But how many of us know how much electricity we're using throughout the day, the week, or even the year? Or even where it comes from? Today, everybody's talking about green energy: renewable energy that doesn't require the burning of a finite resource. Yet the majority of the world's energy sources are still non-renewable. In fact, over half (59%) of the energy used in the world in 2015 came from coal and oil (both non-renewable fossil fuels). In 2015, the total world's energy came from seven general sources. Oil continues to be the largest source of energy around the world, with nearly one third (31.7%) of the world's total. Coal (including peat and shale), provided over a quarter of the world's energy, at 28.1%. Natural Gas has become a significant source of energy, supplying 21.6% of the entire world's needs. Biofuels and waste provide nearly one-tenth of the energy used in the world, at 9.7% of total consumption. Although its safety remains controversial, the world depended on nuclear power to provide 4.9% of our energy. Hydroelectricity is a renewable and sustainable energy source and accounted for 2.5% of total world energy. Other forms of renewable energy, including geothermal, solar, wind, tides, and others, only accounted for 1.5%. That doesn't seem like much but consider in 1973 renewable sources accounted for only 0.1% of all energy consumed worldwide. In 2017 the United States consumed 97.7 quadrillion BTUs (103 exajoules) of total energy, triple what it consumed in 1950. Like the majority of the world, the United States depends on oil and petroleum for over a third of its total consumption, with 37% of all energy coming from those sources. In contrast to the global statistics, the second biggest source for energy in the US is natural gas at 29%. The United States only depended on coal as the source for 14% of the total energy used. 9% of all power consumed in the USA in 2017 came from nuclear power plants. 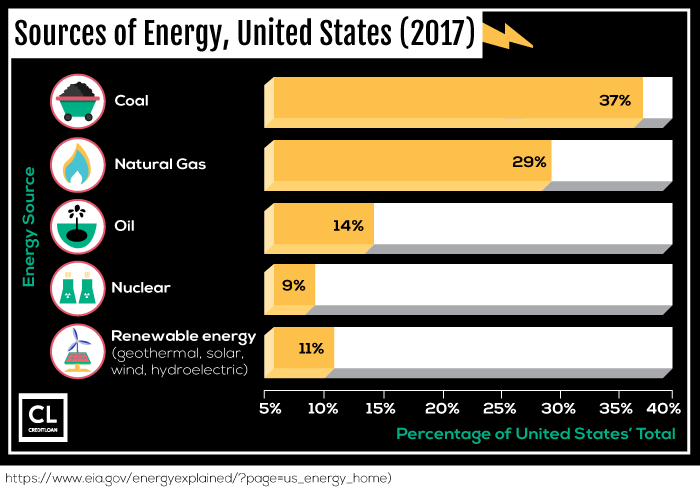 Over one-tenth (11%) of the energy used in the United States in 2017 came from renewable sources such as geothermal, solar, and wind. That statistic also includes power generated through hydroelectric dams. Energy consumption has increased at a faster rate than energy production, so the difference is met through imports. Natural gas powers almost half of the electricity used in the U.S. 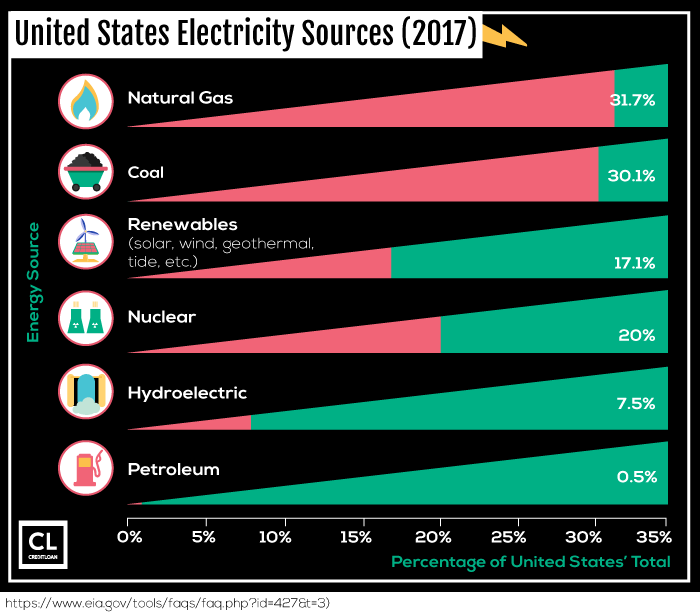 When it comes to all the electricity used in the United States in 2017, almost a third (31.7%) was generated by power plants burning natural gas. Nearly another third (30.1%) was generated using coal for fuel. 17.1% of all electricity consumed in the United States in 2016 came from renewable energy sources like solar, wind, geothermal, tide, etc. 20% of all electricity used in the United States in 2016 came from nuclear power plants. 7.5% of electricity was generated by hydroelectric dams. Only 0.5% came from generators using oil or petroleum for fuel. The environment pays the price when we depend on pollution-emitting sources to generate our electricity needs. In 2016, the total amount of Sulfur Dioxide (SO2) emitted into the air by U.S. electricity generators was 1.8 million metric tons. 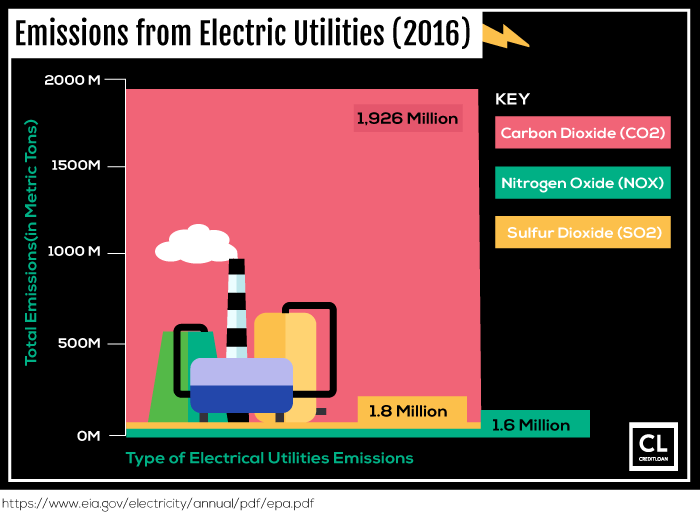 The total volume of Nitrogen Oxide (NOx) emitted as a result of U.S. electricity generation was slightly less, at 1.6 million metric tons. Those emissions can't come close to comparing to the amount of CO2 produced by the American electricity industry, which totalled an astounding 1,926 million metric tons. American homes have a high demand for both cooling off and keeping warm. 15.4% of domestic energy in 2017 was used for air conditioning, while 8.5% was used for space heating and 9.5% was used for water heating. 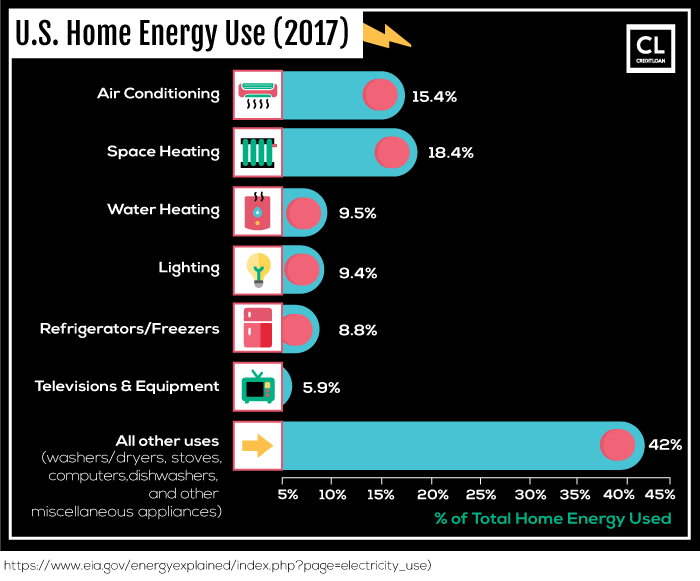 9.4% of all the energy used in U.S. homes was for keeping the lights on, and 8.8% was used for refrigerators and freezers. Televisions and related equipment used up 5.9% of all the power consumed by American homes. 42.5% of U.S. household energy went to all other uses, including washers/dryers, stoves, computers, dishwashers, and other miscellaneous appliances. When it comes to keeping warm, 49% of American households use natural gas heaters or furnaces. 34% of homes in the U.S. are heated using electricity. 6% use furnaces burning fuel oil, and 5% use propane or liquified petroleum gas (LPG). Wood is used as the heat source for 2% of all American households, and 1% are heating their homes using other sources. 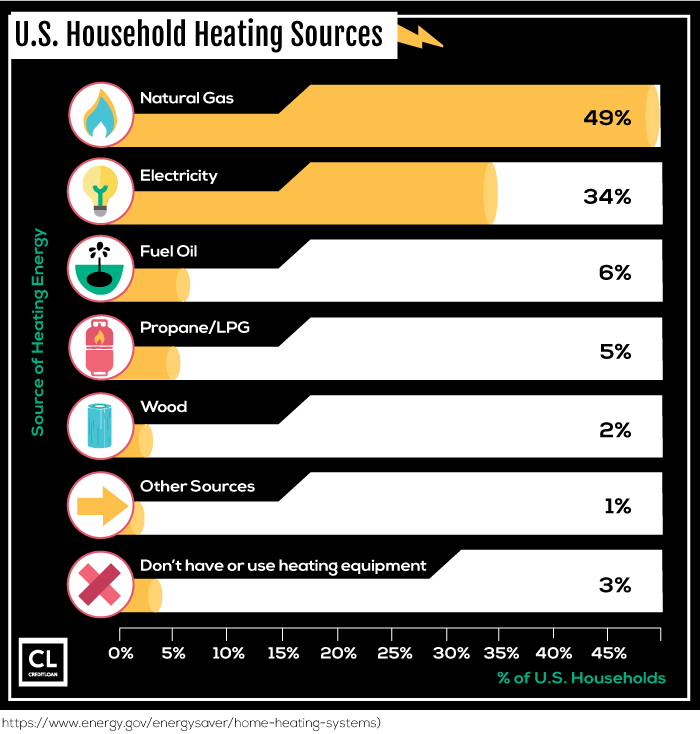 3 out of every 100 U.S. households doesn't use or own equipment to heat their home. 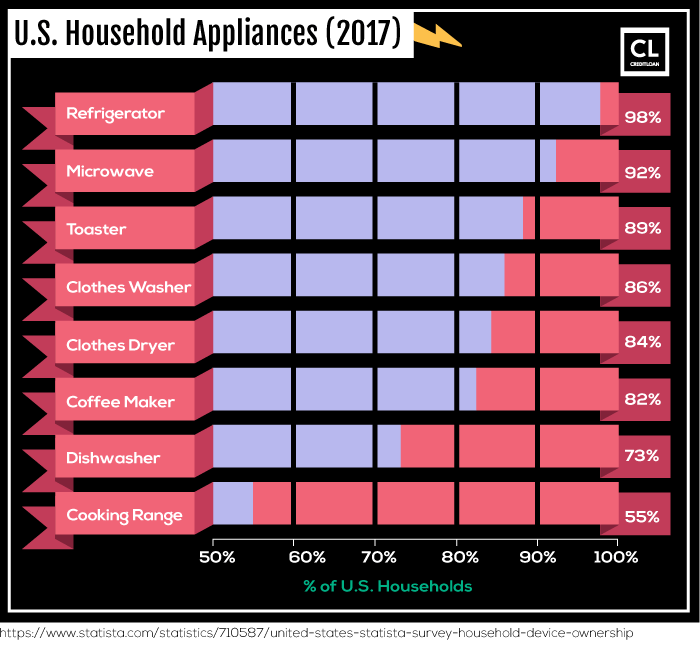 The appliance industry in the United States must be doing well, since the majority of households own a whole list of home appliances. 86% of U.S. households has a clothes washer while 84% have a dryer. You will find a coffee maker in 82% of American houses but less than three quarters (73%) have the luxury of a dishwasher. Surprisingly, only 55% of houses have a cooking range/hood (which means the microwave is winning handily over home cooking from-scratch). In 2015, a little over a gallon of gasoline per day per person was consumed in America. Which isn't surprising considering the average American drove 13,474 miles that year. In 2016 the average Miles Per Gallon among new U.S. cars was a record 24.7 MPG, so at least our cars are using gasoline more efficiently. Ever wonder how much fuel Americans consume per person? In 2015, the average amount of gasoline used by every American was 656 Gallons. Americans took one round trip on an airline on average in 2015, which equals 3 Gallons of airplane fuel per person. The amount volume of natural gas used by each American household on average was 61,320 Cubic Feet. 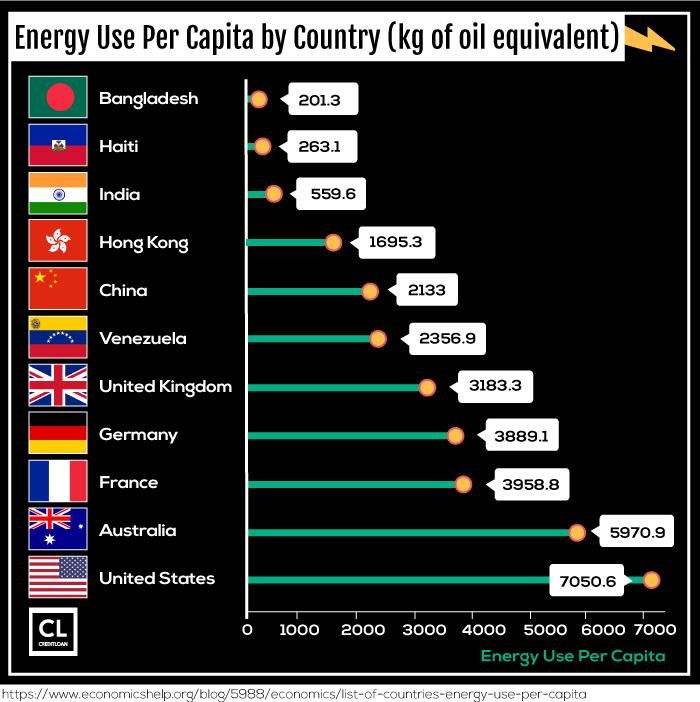 In the United States, the total energy consumption per capita (i.e. per person) in 2015 was 12,071 kWh. That's more than 4.5 times more than the average worldwide per capita energy consumption in 2017, which was 2,674 kWh. If we look at average energy consumption per US person in 2017 as measured in BTUs, the average is 300 million. That's exactly four times more than the world per person average for energy consumption in 2015, which was 75 million BTUs.